Hopewell Brewing Company opened it’s doors in the Logan Square neighborhood in early 2016 and has been a welcome addition to that ever-changing stretch of Milwaukee Avenue. With it’s bright, minimalist interior welcoming a diverse clientele, the taproom is a truly communal space made for big groups as well as intimate conversations. Head brewer, Stephen Bossu, co-founded Hopewell with Samantha Lee and Jonathan Fritz after spending time at Brooklyn Brewing. Their first beer, a lager aptly named “First Lager,” has been their true flagship since they began production on the small 20 bbl system. It’s a crisp, clean straight-forward lager that made the jump from taproom, to distribution and eventually debuted as their first canned offering. 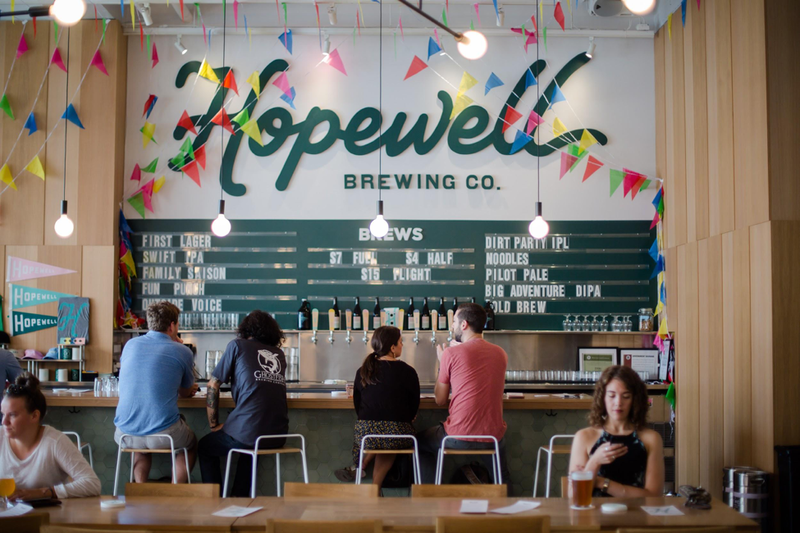 Hopewell also offers a rotating list of beers available at the taproom, from their Family Saison, Swift IPA and a tasty seasonal called Cold Brew; a session coffee ale with 1.5 pounds of coffee per keg that will have you second-guessing whether or not you’re actually drinking beer. Hopewell’s lineup has been fun to follow as they experiment with bottling in large-format, kettle sours, barrel-aging, blending and eventually a true barrel program. They recently acquired two small fermenters to help with capacity in experimentation and one-off beers and hope to do more barrel-aging and fun collaborations. Most recently, Hopewell collaborated with Whiner Brewing on a beer called “Noodles;” a dry-hopped, 100% Brett Saison fermented with each breweries house yeast cultures. It’s a complex beer with ripe tropical fruits, dry funky notes and a clean finish at a quaffable 5.1% ABV. The future is bright for Hopewell as they continue to expand their offerings and find a place for themselves in Chicago. Look for them at Beertacular to see what’s new in the tap line or revisit some of their solid flagship offerings.